This Garlic variety is said to be a favorite among the company's customers. Father's Day is coming! This Father's Day, think of yourself. Get your hubby what you always wanted him to have - A SIX PACK! A six pack of Beefy Boys Beef Jerky that is. Includes ALL SIX of their flavors, including Jamaican Style, Original, Reserve, Teriyaki, Peppered, and HOT! 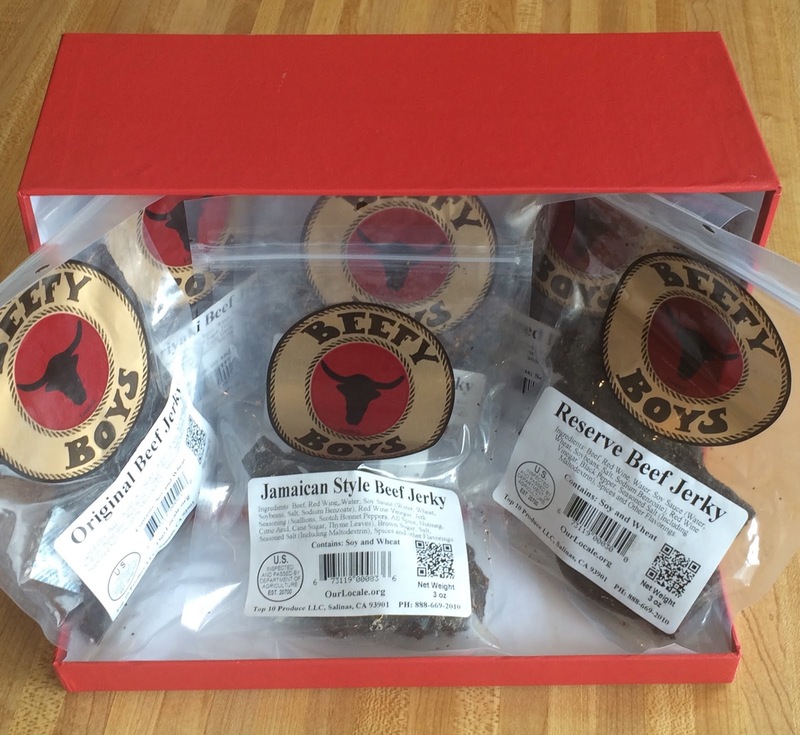 Beefy Boys is 100% made in the USA, using an old family recipe that brings out the natural flavors of beef, combined with a savory marinade that won a "Best" rating from right here on Best Beef Jerky. It's an auspicious time of year with National Jerky Day on the horizon (Sunday, June 12), followed by Father's Day (don’t forget your priest) seven days later on Sunday, June 19. Lawless Jerky has you covered on both accounts with coupon code 'jerkydad25' good for 25% off your order from LawlessJerky.com. If you’re not local to NYC, keep an eye on our Facebook page, and other social media outlets, to learn how you can win Free Jerky for a Year! Lastly, but most importantly, Lawless Jerky is celebrating National Jerky Day with a tremendous donation of 27,000 bags of our 100% grass-fed beef jerky. That translates to over 500,000 grams of nutritious and delicious protein for those who need it most. And this is just the beginning! We’ll follow up this donation to St Vincent De Paul food bank in our hometown of Phoenix with similar donations later this year in Charlotte, Brooklyn, and beyond. Give a 1/2lb each of Original, Cajun, Sweet, and Steakhouse beef jerky, plus 3oz of "Million Dollar Bacon" from Crazy Horse for your dear ole Dad! Forget the necktie, wallet, and skivvies! Forget the Chia Pet, Snuggie, and Sham-Wow! 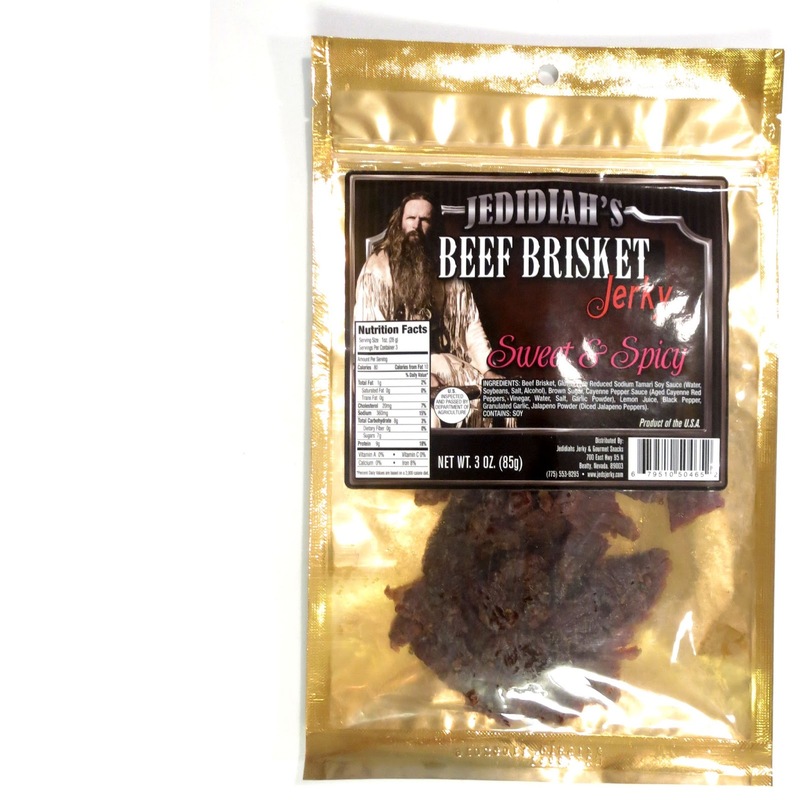 Get dad some good old fashioned beef jerky and bacon! 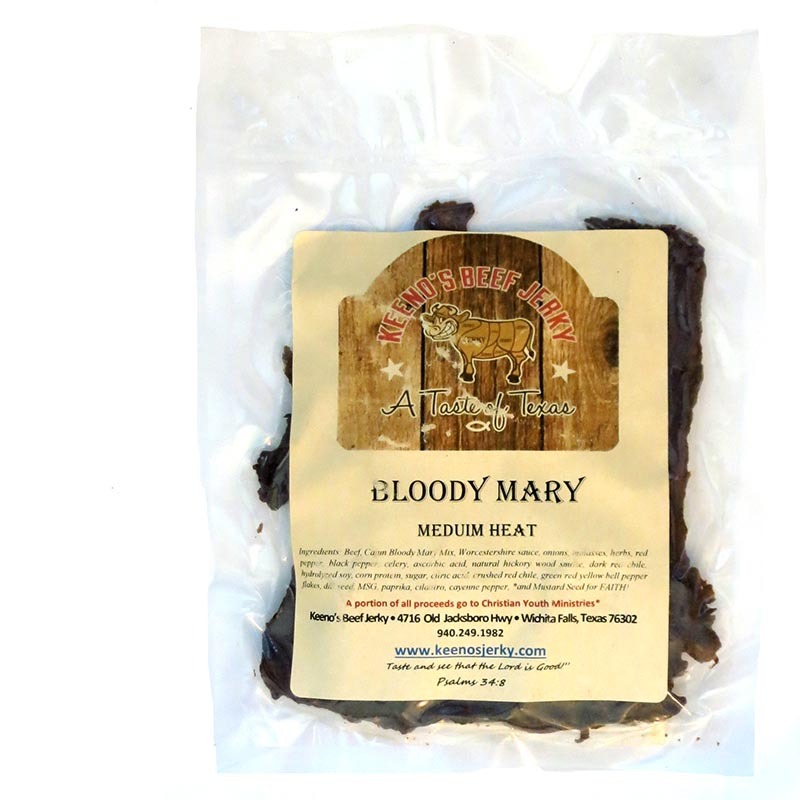 Crazy Horse Jerky is made in the USA, smoked over real wood, in a walk-in smoker, deep in the heart of Pennsylvania Dutch Country. 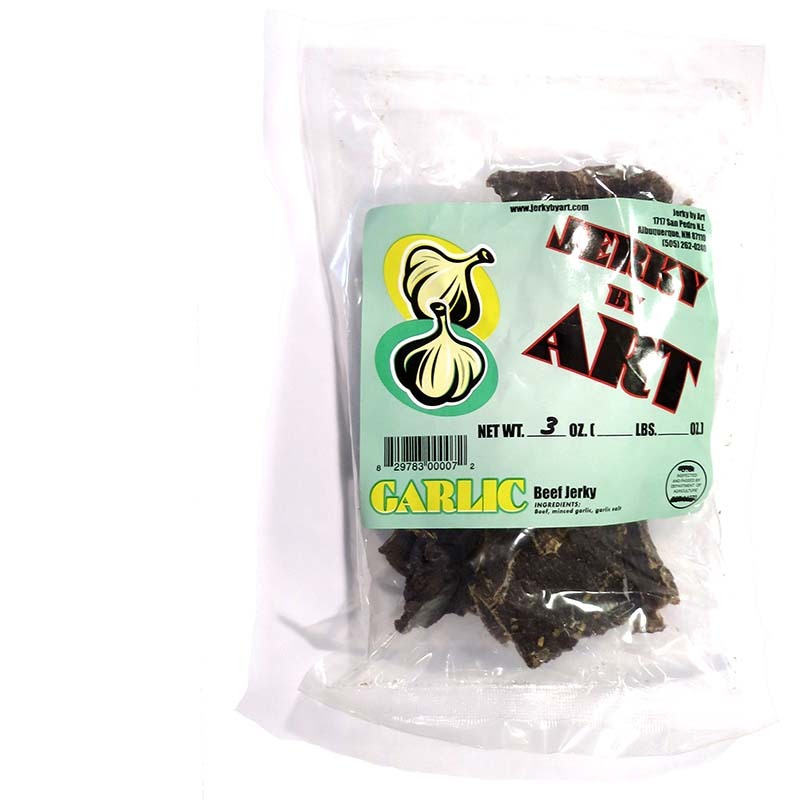 This is REAL American jerky made with real ingredients, just like how it was made a hundred years ago. 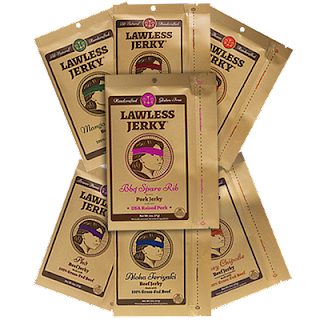 Crazy Horse Jerky has been rated, FIVE STARS right here on Best Beef Jerky. Order by June 10th in order to have it shipped in time for Father's Day!!! And there's free shipping on orders of $40.00 or more. Keno's Beef Jerky is a brand owned by Gary Keeney, baesed out of Wichita Falls, TX. Established in 2010, Keeno's manufacturing process is state inspected, and the company runs an outlet store in the same building. 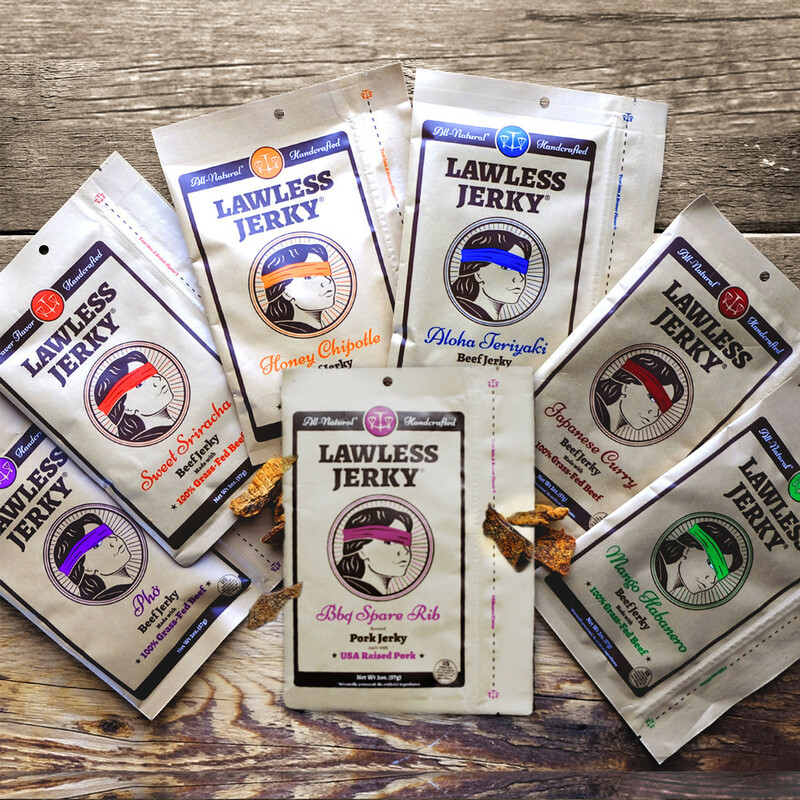 Keeney got into the jerky business while working at Dell Computers, where he sold bags of his homemade stuff to fellow employees. After getting laid off, he went into business for himself with the aid of a $17,000.00 prize for winning the IdeaWF competition hosted by Midwestern State University. 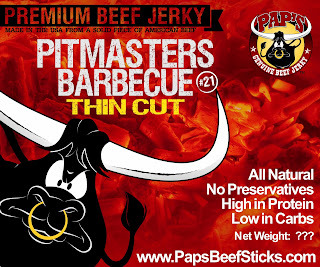 Keeney also won the 2014 Peppers and More World Jerky Contest. 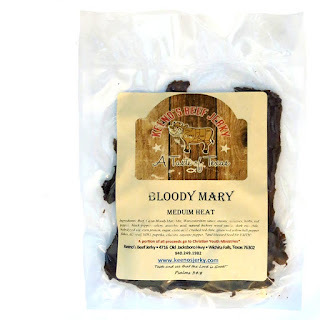 This "Bloody Mary" jerky claims to be based on the same ingredients as Keeno's Salsa Beef Jerky that we reviewed last week, but throws in some Bloody Mary Mix. It also claims to be "Medium Heat". Braaitime is a brand of gourmet cured meats based out of Keansburg, NJ. The company was started in 2005 by Warren Pala. Warren immigrated from South Africa in 2001 and sought to introduce Biltong to Americans. Warren claims to be the only brand of biltong holding true to the old world methods. "All other makers of Biltong have followed the 'jerky' method in order to achive USDA approval. They cook the meat to a certain temperature for a certain amount of time". Warren was able to get USDA approval with the help of local Italians who had already convinced USDA inspectors that their prosciutto & capacolo are shelf stable. 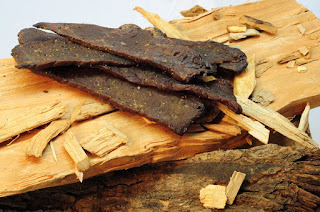 Biltong is a type of seasoned, dried meat whose recipe originated from South Africa. Similar to jerky in description, but tasting very much different, it's traditionally seasoned with vinegar, coriander, black pepper, and salt. 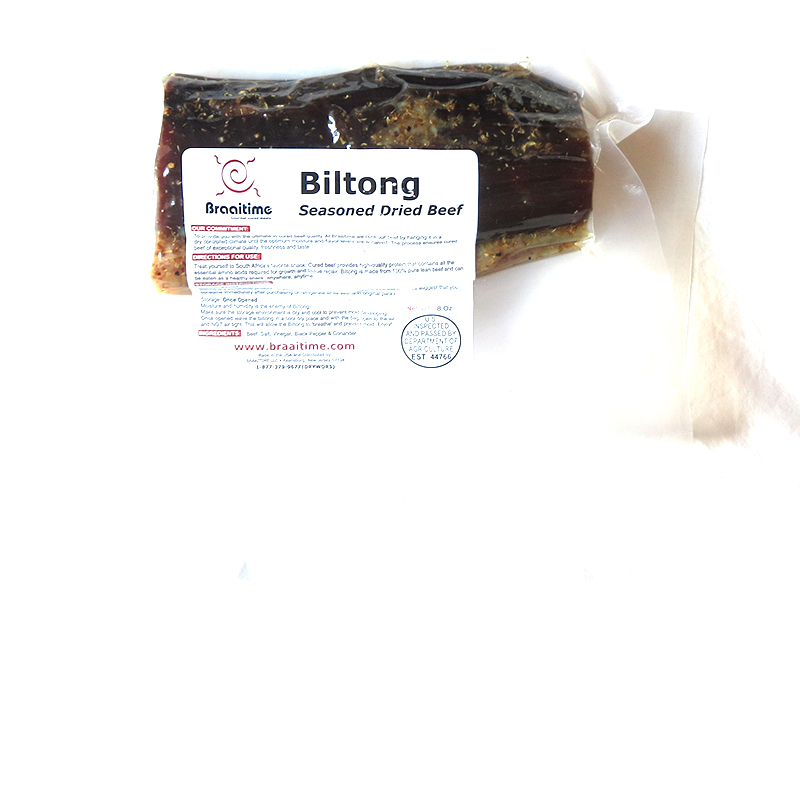 Braaitime sells biltong unsliced, sliced, and flavored in Peri Peri and Garlic, and even in Venison. Guess the weight of the World’s Largest Individual Bag of Beef Jerky! Beginning June 6 thru June 13, 2016 the world’s largest individual bag of beef jerky will be on display at the Five Star located in Danville, KY. to commemorate National Beef Jerky Day on June 12. Simply guess how many pounds of beef jerky are in the bag. The closest guess without going over the actual weight will receive FREE beef jerky for a year. To enter visit Pap’s Facebook page between June 6 thru June 19, Like Us and under Comments leave your guess in pounds and ounces (i.e.5pounds, 5 ounces. Etc.) Dimensions and clues can be found on Pap’s Facebook page and Blog on Pap’s Website. ENTER THE WINNING WEIGHT HERE! The winning entry will be notified via Facebook. In case of multiple correct entries, a winner will be determined by a blind drawing.